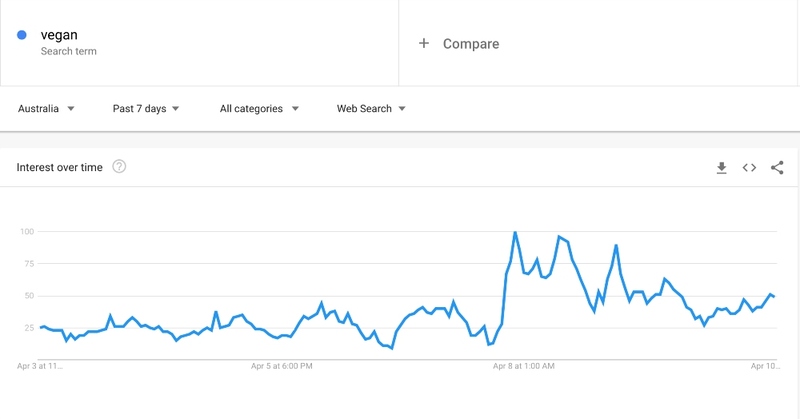 Vegan documentary Dominion was viewed 55,000 times in 48 hours following a series of coordinated protests across Australia, Plant Based News can reveal. The actions, which marked the one-year anniversary of the release of Dominion, included protests outside slaughterhouses in areas across the country including Corio, Pakenham, Toowoomba, and Bacchus Marsh among other locations. 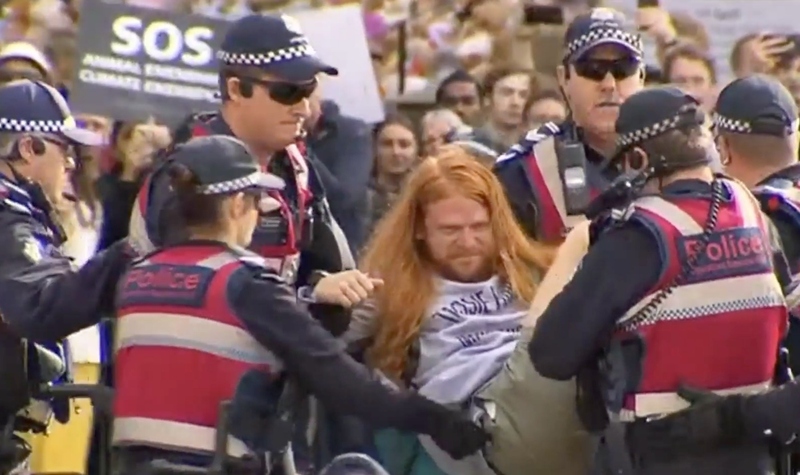 In addition, campaigners brought Melbourne to a standstill, blocking traffic at one of the biggest intersections in the city center while holding signs saying 'you have been lied to; watch Dominion' and 'this is a peaceful protest'. Speaking on television about the protests, Dominion director Chris Delforce said: "I'd urge anyone who felt angered or inconvenienced today to watch the film Dominion or at least watch just two minutes of gas chamber footage from inside pig slaughterhouses. That's how most pigs in Australia are killed. "If you watch that footage you will understand why we had to be there today. The simple fact is that what's happening to animals on farms and in slaughterhouses is intentionally hidden from consumers, but we believe they have the right to know. "We believe this industry needs to be more transparent so consumers can make informed choices about what they want to support because we think most consumers are opposed to animal cruelty." Now Delforce has revealed to PBN that the actions have led to a surge in people watching the film. "In the last 48 hours the film has been viewed approximately 55,000 times," he said. 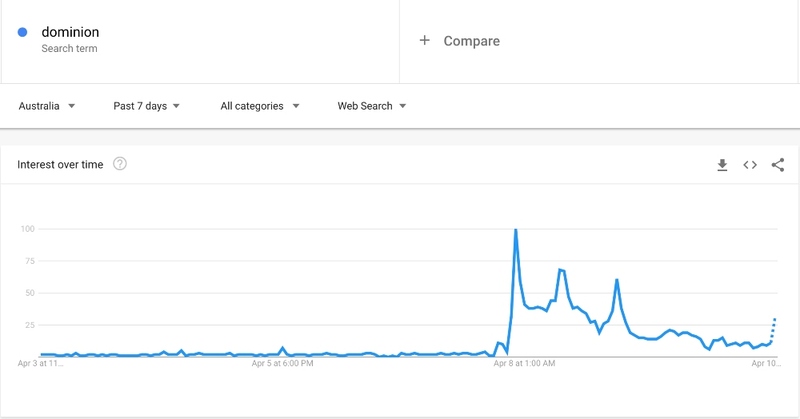 In addition, Google Trends data shows that the number of searches for the terms 'vegan' and 'Dominion' in Australia increased dramatically, with 'protest Melbourne', 'watch Dominion protest', and 'vegan protest Melbourne' the top associated search terms. But the actions also stoked controversy, with Australia's Prime Minister Scott Morrison blasting them as 'shameful' and 'un-Australian' during an interview on 2GB radio. "This is just another form of activism that I think runs against the national interest, and the national interest is being able to farm their own land," he added, speaking on Monday. Following his initial outrage, Morrison confirmed that if he gets re-elected, he will bring in legislation to jail direct action activists who go onto farms and slaughterhouses to get undercover footage for a year. Vegan Business Media and the host of Vegan Business Talk podcast, Katrina Fox, told PBN that the protests have 'started a conversation around veganism and animal rights in Australia'. "We've seen a large number of media reports, some of which were somewhat negative, but also some pleasantly surprising positive ones," she said. "One Australian comedian and TV personality Meshel Laurie publicly thanked the protestors for giving her a wake-up call. It's got people talking and of course, it's a divisive issue. "Vegan and animal rights organizations, as well as individual activists, have received a lot of hate and abuse via email, phone, SMS and social media, but also got support too." Speaking about Morrison's pledge to bring in legislation to punish campaigners undertaking direct action, she added: "My view is that the government and the animal agriculture industry can use the protests as an opportunity to move past the 'us versus them' mentality to come together and collaborate with animal activists on transitioning the country to a plant-based economy. "This is a win for farmers, animals and the public. I think it’s a shame that our current Prime Minister is instead using the situation to further divide activists and the animal agriculture industry for an easy political win, instead of demonstrating ethical leadership by doing something bold that will benefit all Australians."